He would have made it, had he had a Guardini on his wheel, or a Cavendish. 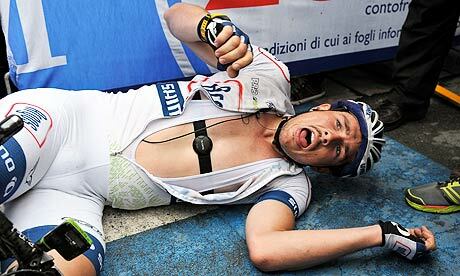 Unfortunately for the trusty domestique, the man chasing him down with a merciless gleam in his eye and fire on his tongue was John Degenkolb, who can, unlike say the Manx Missile, hold it down for more than just 300 meters. And, unlike a non-sprinter, he has that initial force to get up to speed and get away from the other chasers. A great combo of talents for the German, a winning one in fact, but a bad mix as far as the Italian was concerned. Degenkolb was charging like a bull down the finishing straight, no doubt propelled forward by the positive thoughts of his Argos-Shimano teammate Luke Mezgec, he who was the first to go down on that corner and must have been working out his excuses for later on the team bus, even as he first felt his front wheel slip out from beneath him. Must be the strangest sprint win of the German’s already decent career. “In the end I couldn’t see,” said Degenkolb, who usually rides with a Labrador Retriever and a note from his optometrist. You were cheering the Italian on though, right? I know I was. Forza! Forza! Forza! He’s gonna do it! He is! He… oh… nope. He’s cooked. Get the protein shake ready. Canola now must be wishing that he’d done way more threshold training. Repeated one kilometer sprints after 203km in the saddle, that kind of thing. I’m teasing him I know, but really I have bucket loads of sympathy for the lad. Anyone who has raced and been in sight of a win and felt the legs turn into marshmallows with expensive shoes on the end will know the feeling. You want it so bad, you are doing all you can with every blitzed fibre in your being, but the legs just won’t go anymore. What was fascinating yesterday was not just Canola’s desperation but to see just how close the eventual winner also came to blowing – in fact, I think he did blow, his close up in the last 75 meters were more reminiscent of a cyclocrosser pumping through a sand pit than a man on tarmac, but as the others were even more spent, he won by dint of being the best of the battered. And, you could see, by wanting it the most. 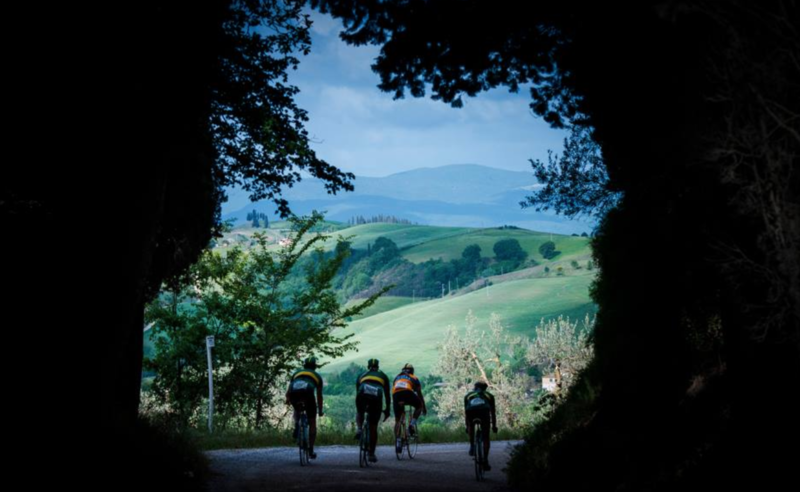 A win in the Giro, well, as Canola said, that is a dream. Blowing up though in sight of the win, I’ve been there often, and ‘humbling’ does not even come close. Still, as bike racers we live and breathe right on the precipice of glory and failure, and I’m sure he’ll dust himself off and carry on, as we all do, time, after time, after time. News from the pack though says they were generally happy with the German’s win, as it means he’s won the bet and can now shave off the Errol Flynn on his top lip. Which should make him faster – take note, Mark Cavendish! Bradley Wiggins’ sideburns have a lot to answer for. Whilst we are on the subject of hair, I read recently that the English ex-pro Chris Boardman used to get very technical about his leg hair. “You can shave in a certain way so that you leave your legs rough down the front edge but smooth at the side, creating an aerodynamic effect,” said Boardman. Speaking of time, the ITT comes tomorrow. 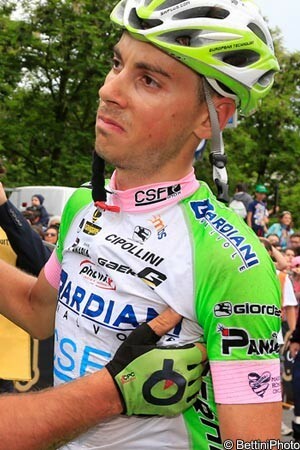 Can Paolini ‘do a Voeckler’ and hang on to Pink for a few more days? Very unlikely, has to be said. The accounts of Wiggins’ demise will be either confirmed by the end of Stage 8 or thrown out on their collective ear. It’s a longish one, almost 55km, and though not flat it is very much a course suited to power. A guy with a high cadence, a smooth stroke and a pedigree in the big ones will be relishing the prospect. Know anyone that fits that description?